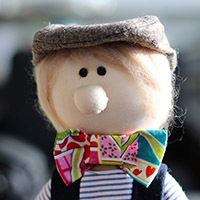 This fabric doll will appeal to all ages and will stand on your desk or shelf and keep you company all day long! She is a bit of a tomboy and wears denim dungarees, a striped T shirt and blue sneakers. 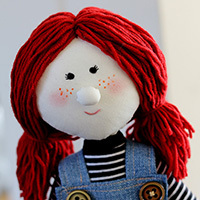 She has red hair and a freckled face. Her hair is made of soft merino wool and the body is made with cotton fabric. She stands 15" (38cm) high. 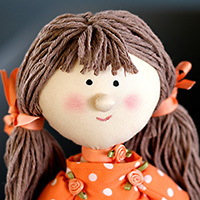 Nutmeg is a fabric doll will appeal to all ages and will stand on your desk or shelf and keep you company all day long! She is a wearing an orange dress with white polka dots and has little flowers for decoration. She has light brown hair and white boots and socks. Her hair is made of soft wool and the body is made with cotton fabric. Full of fun, bright and cheerful ! 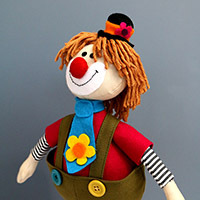 This clown soft doll will stand quite happily in your home. Made of cotton fabrics and felt he is great for kid's of all ages. He has slightly bendy legs to you can adjust his stance. He stands 15" (37 cm) high. Please note this doll is made to order and will take 7-10 days to make. 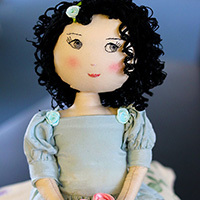 Adorable fabric doll - she will sit on your chair or shelf and keep you company all day ! Darling Rosebud is wearing a silky pale green dress and a lacy petticoat. She has satin boots is holding a bunch of pink rosebuds. Her face is hand embroidered and has curly black hair. 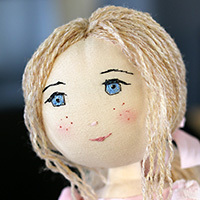 Sugar Plum is a fabric doll with long golden hair, bright blue eyes and sweet smile. green lace knickers and she has a lilac velvet purse. Her long hair is tied back with a baby pink ribbon. Her face is hand embroidered. She will happily sit on a chair, cushion or shelf and keep you company. The perfect gift for a girl or woman who loves all things pink and girly! Pierre is a fabric/cloth doll - he is wearing dark blue shorts with braces and a blue and white striped shirt. He has brown boots and a colourful bow tie ! He also wears a cap and carries a real leather briefcase. His blonde hair is felted merino wool. He stands 14" (36cm ) high. He will happily stand on a shelf or desk and keep you company as he is not so much a doll to be played with but more of a companion !